WILLISTON, N.D. – April is Celebrate Diversity Month and from Monday, April 8 to Friday, April 12 Williston State College students, faculty, and staff will host their 4th annual Diversity Week. Daily diversity events ranging from speakers to activities will raise awareness of different cultures, customs, and lifestyles. Beginning Monday, April 8, a Diversity Discussion Panel will be held at 7:00 p.m. in the Teton Lounge. Four countries – Australia, Germany, Canada, and Brazil – will be represented by current WSC students open for conversations and questions. 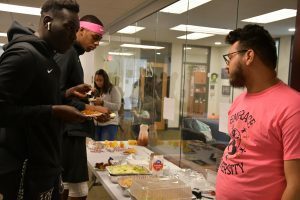 On Tuesday, April 9, WSC students, faculty, and staff will be able to sample cuisine from across the globe at Diversity Club’s Taste of Cultures. Tuesday night, a Say What?! speaker will take the stage at 7:30 p.m. in the Teton Lounge. Say What?! uses humor, interactive talk, and exercises to create an impactful and meaningful learning environment for participants and encourages students to be aware of cultural differences and to have an open, yet respectful dialogue. A Black Light Volleyball Tournament will be held on Wednesday, April 10 in the Skadeland Gym with a free will donation to raise money for Braxton Raymond, a student-athlete of WSC fighting a brain tumor. Weismann’s COMM 216 Intercultural Communication class will host a Culture Carnival on Thursday, April 11 from 11 a.m. to 2:00 p.m. in the Teton Lounge. The Tuesday through Thursday Diversity Week events are internal activities for WSC students, faculty, and staff. Friday April 12, Educational cultural posters created by Diversity Club and students from the WSC Adult Learning Center will be hung around campus. Students from WSC’s Diversity Club, Diversity Committee, COMM 216, the Adult Learning Center, and Student Senate are involved in this week’s events. If interested in discussing a sponsorship, or to learn more about Diversity Week, please contact Kim Weismann at 701.774.4503 or kim.weismann@willistonstate.edu.